Strong winds have brought down power lines and trees and caused travel disruption in the South West. Gusts of up to 92mph were recorded at Prawle Point, where a Coastwatch volunteer was "stuck to the wall" by the strength of the wind. Rail passengers, already hit by strike action and engineering works, have experienced "significant disruption" between Penzance and Bristol. High winds have halted replacement road transport. Great Western Railway and CrossCountry said they were working together to do all they could to help customers and to keep them informed. They said they would provide road transport as soon as they could and have asked passengers "to be patient". 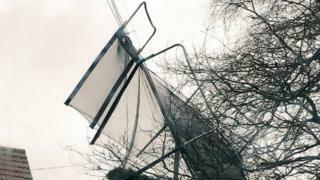 The Taw Bridge was closed to high-sided vehicles after gusts of 75mph were recorded, while power lines were brought down by a "flying trampoline", according to police in Exeter. There are currently about 1,500 properties without power in the South West, Western Power Distribution said. National Coastwatch volunteer Nigel Cobb had to abandon his car and climb over fallen trees to reach Prawle Point station. "It is very unusual for the winds to be that strong - I've never known it as bad," he said. "My colleague went out to open the visitor centre next door and she literally got stuck to the wall by the wind." The Environment Agency has also issued a flood alert for the Middle Exe area.